The Java String replaceAll method is one of the Java String Method, which is used to replace each sub string that matches the regular expression with newly specified string. In this article we will show you, How to write String.replaceAll method in Java Programming Language with example. Before we get into the example, the basic syntax of the String.replaceAll is as shown below. The Java Programming Language provides String.replaceAll Method to replace the matching substrings with user specified String. Java String.replaceAll Method will accept two string arguments, first argument (regexp) is the regular expression that represent a substring existing in the String_Object, and the second argument (Replacement) is the substring that you want to replace with. The String.replaceAll in Java is used to replace the matched substring with user specified new string in a string object. In this Java program we will use the substring as the first argument. 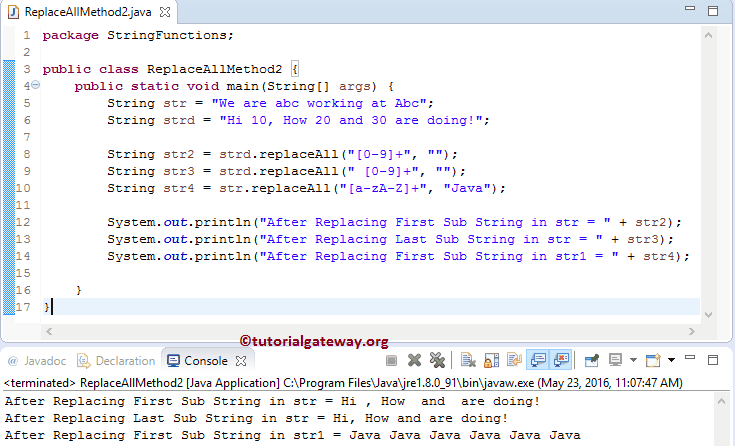 This may help you understand the basic functionality of the Java string.replaceFirst method. Following statement will call the public String replaceAll(String Regexp, String Replacement) method to find the substring ‘a’ and replace it with ‘x’. Following statement will find the sub string ‘abc’ and replace it with sub string ‘xyz’ . The String.replaceAll in Java is used to replace the existing substring with user specified new string. This Java program will help you to understand the use of regular expressions in Java string.replaceAll method practically. Following statement will call the public String replaceAll(String Regexp, String Replacement) method to find the sub string ‘[0-9]’ and replace it with sub string “” . It means, it will replace the numbers between 0 and 9 with empty space. From then above screenshot you can observe that the above statement is returning the output with extra spaces. So, we just altered the above statement to get rid of extra spaces. Following Java String replaceAll statement will find the sub string ‘[a-zA-Z]’ and replace it with sub string “Java” . It means, it will replace the alphabets between a and z, A and Z with Java.